I took a Book Art class at the Harvard Extension School during the spring of 2005. Familiar Storefronts in My Town resulted from the alphabet book assignment. 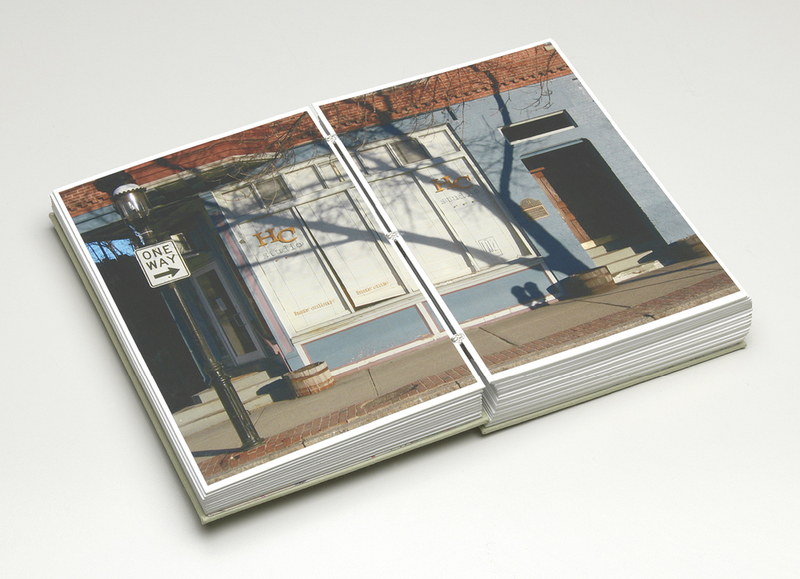 I took photographs of A to Z named storefronts and assembled these into a wire-bound book that sits in a map-lined case. The Pizza Stop made the cover. Pete calls the store Jimmy's, for no apparent reason, so you'll find it between the Inner Space yoga studio and Kurkman's Market. I learned the wire binding of the fold-out book from a course given by Daniel Kelm of the Wide Awake Garage in Easthampton Mass. Stainless steel wires are strung through folded and dry mounted pages where they gain thickness, and are then stitched together with string at the points wires peek through small openings at the fold. I made several of these during this time and enjoyed the process and result. Eventually I stopped binding the books though, and continued only with the photographs on dry mounted pages that I stacked and boxed. The 5 1/2 x 8" book has a depth of 2 1/4" making the accordion nature of its wire binding particularly satisfying to hold. It was a fun exercise, with some historical relevance as some of the storefronts are no longer in business. I took all of the photographs early one Sunday morning, on February 13th, 2005, between 8 and 9 am.